Is Washington negotiating in “good faith” given its sanctions, espionage and two wars in the region? Things are looking up a little on the Iran front, even though talks in Tehran between Iran and the International Atomic Energy Agency (IAEA) ended without a deal. Before the talks, Iran had suggested it might be ready to meet the IAEA’s demand to visit an off-limits site called Parchin, though that didn’t happen. On February 26, talks between Iran and the world powers, including the United States, are scheduled in Kazakhstan. There, too, a breakthrough isn’t likely, for two reasons. First, the United States does not seem prepared, yet, to take the two steps that it must in talks, namely, to acknowledge Iran’s right to enrich uranium on its own soil and to offer to relax economic sanctions on Iran as part of a deal. And Iran, caught up in the early days of what promises to be a lively if not tumultuous presidential campaign leading to elections in June, may not be ready to make any sort of deal with the Great Satan. Still, Iran is taking steps to ease tensions, including processing 20-percent-enriched uranium into fuel rods for a research reactor, which makes the uranium unsuitable for weapons production. So it’s useful to take a look at an important speech delivered recently by Ayatollah Ali Khamenei, Iran’s Supreme Leader, thanks to a text provided by Iran’s Mission to the United Nations. For more than thirty years, the enemies of the Iranian nation have done everything in their power to harm the Iranian nation. There is not a thing which they have not used against the Iranian nation. They provoked conflicts, waged wars, supported the enemy of the Islamic Republic with all their power and they waged hard and soft wars.… They made use of everything they could. They hatched plots, launched coup d’états, provoked military conflicts, shot down passenger airliners, imposed heavy sanctions and increased them on a daily basis. And, of course, President Obama launched a major cyberwar offensive against Iran which, had it been done it reverse, would have been branded an act of war, not to mention what appears to be a US and Israeli campaign to assassinate Iranian scientists. Now the Americans have raised the issue of negotiations again. They repeat that America is prepared to directly negotiate with Iran. This is not new. The Americans have repeatedly raised the issue of negotiations at every juncture. Now their newly appointed politicians repeat that we should negotiate. And they say that the ball is in Iran’s court. It is you who should explain the meaning of negotiations that are accompanied by pressure and threats. Negotiations are for the sake of proving one’s goodwill. You commit tens of acts which show lack of goodwill and then you speak about negotiations. Do you expect the Iranian nation to believe that you have goodwill?… We do not see any goodwill. Their agents, their allies and Zionist spies openly killed the scientists of the Islamic Republic. They did not even condemn these terrorist activities. [On the contrary] They supported them. This is their record. They imposed sanctions—which they wanted to be crippling—on the Iranian nation. They openly said, crippling. Who do you want to cripple? Did you want to cripple the Iranian nation? Do you have goodwill? I am not a diplomat. I am a revolutionary. I speak openly and honestly. A diplomat says something, but he actually means something else. We speak openly and honestly. We speak clearly and decisively. Negotiations are meaningful when the two sides show their good intentions. [Negotiations are not meaningful] when one side does not show his good intentions. You yourselves refer to this as pressures and negotiations. These two things are not compatible. You want to point the gun at the people of Iran and say, negotiate or we will shoot. You say these things to intimidate the Iranian nation. You should know that the Iranian nation is not intimidated by these things. To tell the truth, it’s difficult to find fault with Khamenei’s logic. Iran is, in fact, participating in talks with the IAEA and the P5+1. Iranian President Mahmoud Ahmadinejad on Sunday reiterated his desire to engage in direct talks with the United States, on the condition that the West stop pressuring his country. 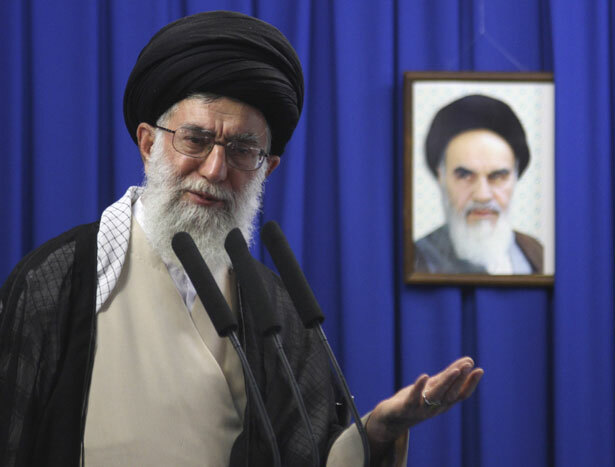 Iran’s supreme leader, Ayatollah Ali Khamenei, rejected any idea of bilateral talks with the United States on Thursday, in a speech in which he seemed to dismiss the views of Iranian officials—including the country’s foreign minister—who had advocated for such negotiations. But it seems that Khamenei and Ahmadinejad were both saying the same thing, namely, that they’ll negotiate as long as there is no gun to their head and if they are convinced that the United States is negotiating in good faith. Just because he outlined a good domestic agenda in his State of the Union address, Barack Obama shouldn’t get a pass on his plans to continue our dirty foreign policy.